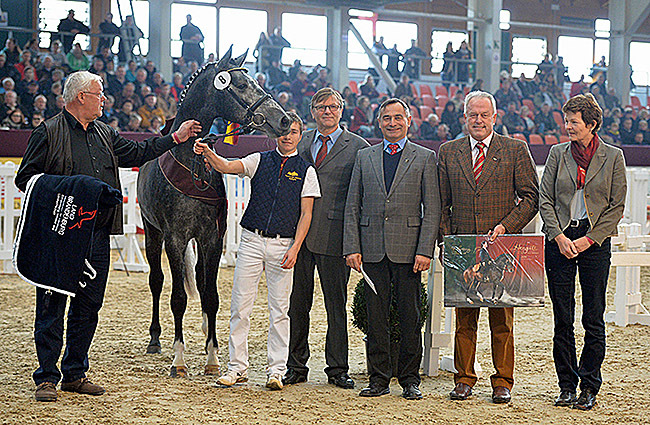 GERMANY (by Lara Becker) Premiere offspring by DSP Belantis and Lord Fauntleroy were convincing during the Brandenburg stallion licensing at Neustadt (Dosse). Five sons of the stallions DSP Belantis, Depeche Mode, Decurio, Cellestial and Lord Fauntleroy were awarded the desired ‘premium’. The first licensing of German Sport Horses, a lot that included the vice-world champion and the Bundeschampion DSP Belantis (Benetton Dream FRH - Philharmoie x Expo’sé), was eagerly aticipated, and he presented himself in this sold-out show-arena in an impressive manner under his rider Beatrice Buchenwald. Three of his sons were subsequently licensed, with one being ‘premium’ awarded. A son of Belantis out of a mare by Quaterman x Paradiesvogel was presented by Landgestüt Neustadt (Dosse) and showed agile and smooth movements. “In his trot he was balanced and in a complete rhythm throughout his movements, and when trotting free, this was once more increased. Very skilled was his canter in the figure of eight where he presented steady flying changes,” said Dietmar Schulz, representative of the licensing committee.